Habib University invited the esteemed MIT Professor of the History of Technology, Dr. Deborah Fitzgerald on the 23rd of November to its campus. Dr. Fitzgerald has been in the field of education for over three decades, and was the former Dean of the MIT School of Humanities, Arts and Social Sciences. She was invited to speak to audiences about her experiences at MIT and its inclusion of the Liberal Arts program, and how it has helped MIT gain technical leadership. 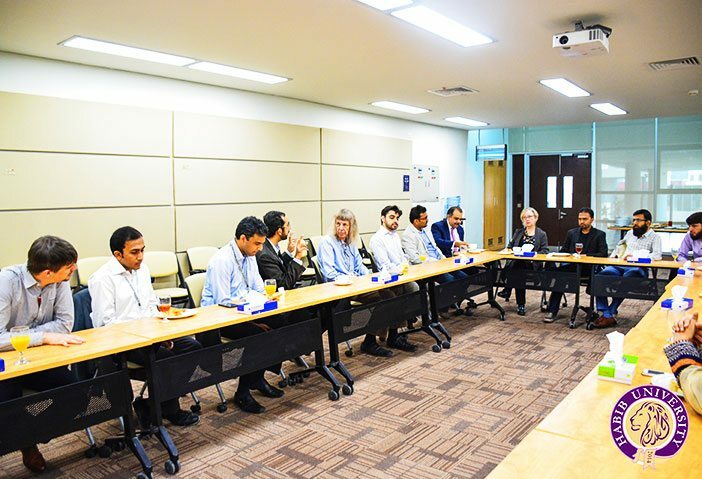 Dr. Fitzgerald’s Monday was spent at Habib University, starting off with a casual breakfast with the faculty of the School of Science and Engineering. She was introduced to several of the faculty members of the SSE, who expressed their gratitude at her presence. The faculty each introduced themselves and their educational backgrounds, and spoke of how HU’s vision and mission drove them to teach at the University. They also told her of the difficulties they face in changing the direction of universities that are already established in Pakistan, and expressed their enthusiasm at being around at a time when the university is still being shaped. Dr. Fitzgerald commented on how impressed she is with how Habib University is integrating the Arts, Humanities and social Sciences and STEM education, saying that this level of integration isn’t usually found elsewhere. Later on, she accompanied Dr. Anzar Khaliq, Director of Integrated Sciences, School of Science and Engineering to the Arif Habib classroom, in which a musical morning was arranged by students and Sindhi folk singers, by the Associate Professor of the Arzu Center for Vernacular Languages, School of Arts, Humanities and Social Sciences. 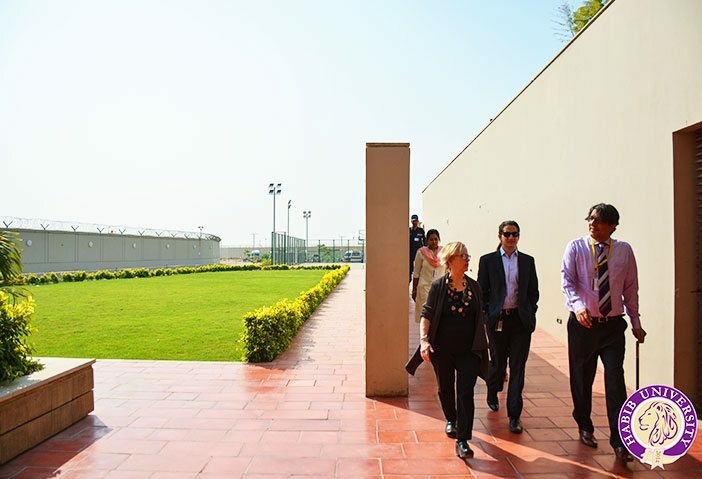 Dr. Fitzgerald was then escorted by the President of Habib University, Mr. Wasif Rizvi, on a tour of the campus grounds. The early morning sun lit up the campus as Dr. Fitzgerald and Mr. Rizvi covered the campus grounds, from the auditorium to the Ehsas Center, the library, the amphitheater and the student lounge. Commenting on the structural plan of the campus. Dr. Fitzgerald praised how it resembles internationally renowned structures she has visited, and that the sports complex especially was perfect for students. 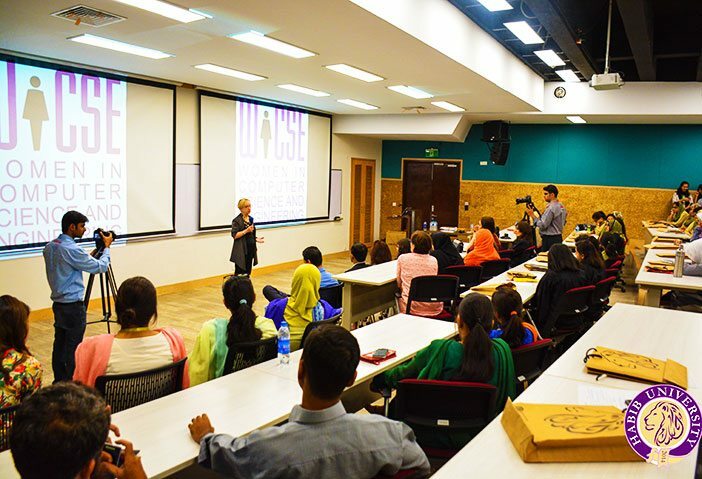 After the campus tour, Dr. Fitzgerald was invited to join the debate happening in the Tariq Rafi center, where the WiCSE panel was addressing concerns by prospective students hailing from different high schools around Karachi. WiCSE, the Women in Computer Science and Engineering, is a student-led group that promotes the role of women in the Science and Engineering fields. The aim of this debate on November 23rd was to address queries of prospective female students who felt discouraged or hesitant in entering this course of education. The event was moderated by Dr. Waqar Saleem, Program Director, Assistant Professor of the School of Science and Engineering. The President offered a welcoming note to the audience, made almost entirely of young women, and spoke of the role of determination in choosing one’s own field of education. He also introduced Dr. Deborah Fitzgerald to the audience, and she took the stage to wild applause. Speaking of her history and inclusion in Liberal Arts education, she referenced her time as the former Dean of Humanities, Arts and Social Sciences where she served for 10 years before stepping down. Talking to the young women, she offered great words of advice about planning the future. “You’re all very young, you don’t have to have a 10 year plan, you must first ask yourself what is it that makes you happy, that you want to do when you wake up in the morning, and follow that route”. She also urged the students to never be discouraged by what they’re told they’re bad at, to give different fields of study a chance, and then decide what they really aspire to become. After the WiCSE session, Dr. Fitzgerald attended a lunch with some students of the School of Science and Engineering. This was a smaller, casual affair where students put across some questions about Dr. Fitzgerald’s research interests, specifically food and agriculture and the scenario in Pakistan. Talking to students about the global issues regarding processed food and the anthropological differences of nations across the world, she also related to students how the demographic classes react to the lack of “fresh” foods and the abundance of easier alternatives such as frozen foods. The students also put across their queries of how MIT uses its technical expertise to understand and cater to these differences, and how the research interests vary in Dr. Fitzgerald’s field of study. .
Dr. Fitzgerald’s evening was taken up by the third Yohsin Lecture, “The MIT Story”. The event, attended by over 800 people, was an immense success, with opening notes from the President Mr. Wasif Rizvi and the Dean of the School of Science and Engineering, Dr. Shoaib Zaidi. 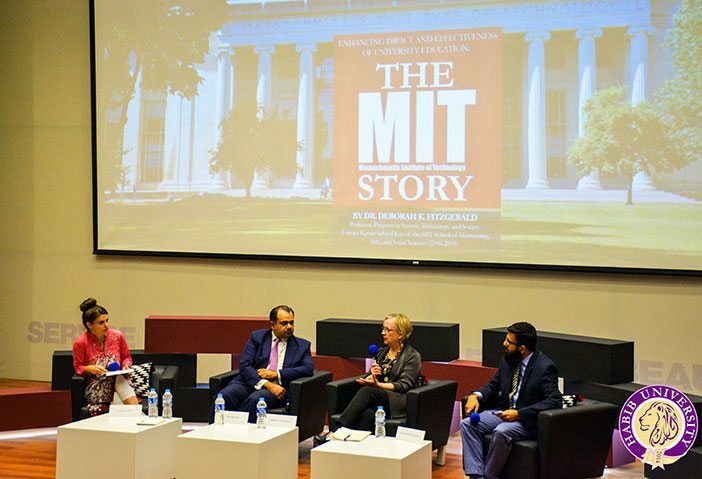 Addressing the massive crowd, Dr. Fitzgerald made some excellent points about the role of Liberal Arts education both at MIT and in the United States as a whole. She commended the efforts of Habib University in bringing a first-of-its-kind Liberal Arts education to Pakistan, and said she had high hopes for the graduates of the University. “All eyes are on you”, she said, referring to students attending the event. The evening concluded with refreshments for the attendees and a dinner with the President and faculty for Dr. Fitzgerald. Dr. Fitzgerald made time for this trip with a very tight schedule, and we at Habib University are very grateful and honored by her presence. She appreciated the institute, was very excited for the prospects that this opens up for students in the future, and shared her wisdom about the Liberal Arts in different settings from her time at MIT. We hope that she joins us again soon, and will cherish the time she spent at Habib University.